It’s summer. It’s hot. It’s REALLY hot. And while a majority of your time will be spent indoors in the coolness of your overworked air conditioner, duties do compel you to step outside on occasion, and, of course, drive. There are only four things in your car separating you from the ground: your tires. As your tires are sensitive to temperature variations and other environmental factors, is crucial that you check them more often during the searing summer months. All tires (when we say ALL we mean the spare too) should be checked regularly. You should look for any visible signs of wear or damage, such as deep cracks, exposed cables, cuts or uneven wear of the tires. The depth of the tire tread indicates the remaining service life. To determine the tread depth, a tread depth gauge can be purchased and used. You can fail your RTA road worthiness test if your treads are too worn down. High temperatures increase the drop of air pressure significantly. 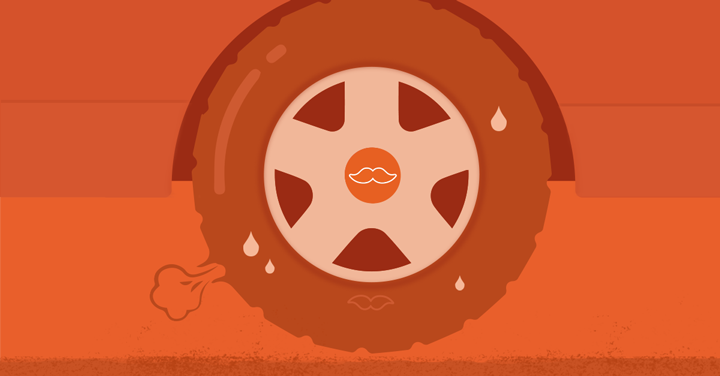 Normally, tires lose about 1 kg of air a month, but in the summer, this can go up quite a bit. Poorly inflated tires increase the changes of tire failure, wear and tear, increase fuel consumption, and may affect braking effectiveness. Check the air pressure when the tires are ‘cold’ – i.e. you haven’t driven more than 2 km or for at least two hours. Vibrations? Check the tire balance. If you feel any sort of vibration through the steering wheel or through your car, your tires could be balanced incorrectly. If you let go of your steering wheel and notice that your car naturally drifts to a certain direction, your alignment is off. This can be due to uneven tire wear (in that case, replace your tires), or because you may have caused some damage to your wheel when you hit a curb or a pothole. Uneven alignment increases your chances drastically, especially in summer, of having a tire burst – a very dangerous and potentially fatal outcome. You can’t fix tire alignments yourself – you’ll have to take your car to a garage for that. Remember, your tires are the only contact point between your car and the ground, so proper maintenance – especially during the summer months – is crucial. Other common-sense rules should be followed to, of course. For example, never overload your car as this wears down your tires quickly. Bad shock absorbers will also negatively affect your tires. If you need a professional to have a look, we got what you need here at mrUsta. Just a post a job here.